As Suicide Prevention week comes to a close, we wanted to share this infographic on the impact of suicide in the US, courtesy of the Social Work Degree Center. We hope that in this past week millions of people have been exposed to the facts, statistics, stories, and impact that suicide has on individuals and communities worldwide, and that they came away with a better understanding of this public health crisis. Greater education on this topic will hopefully bring about a reduction in the stigma surrounding mental illness and suicide, ultimately resulting in more people seeking and receiving help. Today we recognize World Suicide Prevention Day and in its first ever global report on suicide, the World Health Organization reports that a staggering 800,000 lives per year are lost to suicide worldwide; one person every 40 seconds. 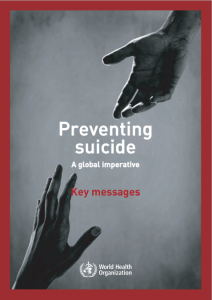 National prevention plans endorsed by governments could go a long way in preventing suicide, but currently only 28 countries have such strategies. Most people who die by suicide have a diagnosable mental illness. It’s extremely important for mental illness or substance abuse issues to be identified, diagnosed, treated, and managed as early as possible. Follow up care plays a huge role in keeping someone safe if they have previously had thoughts or made attempts at suicide. Phone calls, visits, and other regular contact with health professionals is key, as well as vigilance among family and friends. In almost all regions of the world, people over age 70 have the highest rate of suicide. Globally suicide is the leading cause of death for 15-29 year olds. You can read that full report by the WHO here. If we could impart just one thing on society it’d be this: Suicide is preventable, and it’s everyone’s business. It takes all of us, every single person out there, to help prevent suicide. Of course social workers, therapists, psychologists, doctors, and nurses all have an important role to play. But it’s the teachers, coaches, colleagues, professors, employers, friends, and family who are arguably the ones on the front lines of suicide prevention. They are the ones with the opportunity to recognize the warning signs, be aware of the risk factors, and know the difference between myths and facts. They are some of the first ones who should ask the direct question about suicide, and be ready and accepting of an honest answer. They can make a world of a difference by being there to listen without judgment even though the conversation can be uncomfortable and scary. They are the ones who can help most in reducing the stigma and shame all too commonly associated with mental illness and suicide. Suicide prevention is everyone’s responsibility. And of course we have to give some major recognition to all of the suicide prevention helpline workers all around the world who save countless lives every single day through the simple act of being there. You are there for people at all hours to listen, empathize, normalize and validate feelings, and provide resources. For many people that phone call, text, or chat session is the first step at getting help, and your warm, accepting demeanor reassures them that they will encounter kindness and understanding along the way, and that there is hope. Thank you, we at iCarol are honored to play a small part in the incredible work you do. How will you recognize Suicide Prevention Month? Suicide Prevention Month is quickly approaching, with Suicide Prevention Week being recognized from September 8th – 14th and World Suicide Prevention Day on September 10th. There are lots of ways you can recognize this upcoming event. Join an Out of the Darkness Walk near you. These walks help raise awareness as well as money for research and education. During the month of September, particularly during suicide prevention Week, dozens of these walks will be held. Find one near you and register today. Donate to a suicide prevention service in your area. You can donate to organizations that focus on research or education, though we humbly suggest you consider donating to a helpline that provides direct help and suicide prevention to those in need. Whether you’re in Canada, the US, or another country, there are suicide prevention lines near you that would greatly appreciate your donation and will put it to excellent use in directly preventing suicide in your community. Volunteer for a suicide prevention service. These services are always looking for qualified volunteers to answer phones, help with fundraising efforts, and more. Suicide prevention month is a great time to start the application process. Educate yourself on the topic of suicide. Did you know that suicide is the 9th leading cause of death in Canada and 10th in the United States, or that the elderly are at the highest risk of suicide? By learning the notable statistics, risk factors, warning signs, and myths and facts about suicide, you’ll be empowered to do more and share that knowledge with others. Receive training on how to help others who are suicidal. Suicide prevention is everyone’s responsibility and everyone is capable of doing something to prevent it. Trainings like ASIST, safeTALK, QPR, and Mental Health First Aid are some examples of common trainings that may be offered in your community. Spread the word with social media. Whether you use Twitter, Facebook, Instagram, or all of the above, post information in support of suicide awareness and prevention. Maybe try sharing some of those facts you learned, or share a personal story about how suicide has touched your life, or the life of someone you care about. Discussing suicide goes a long way in reducing stigma and bringing the issue out into the open where it belongs! Alert the media and use your expertise or experience as a helpline agency to do a story on suicide prevention in your community and how people can be helped by contacting you. Agencies that have texting and live chat services always have a great angle for contacting the media to do a story on how those struggling with suicidal thoughts can use those services if they don’t want to call on the phone. Whether you take one of these actions, or do something different, it’s important to recognize suicide prevention month. Your actions will show others that you care about raising awareness of suicide, and preventing it.